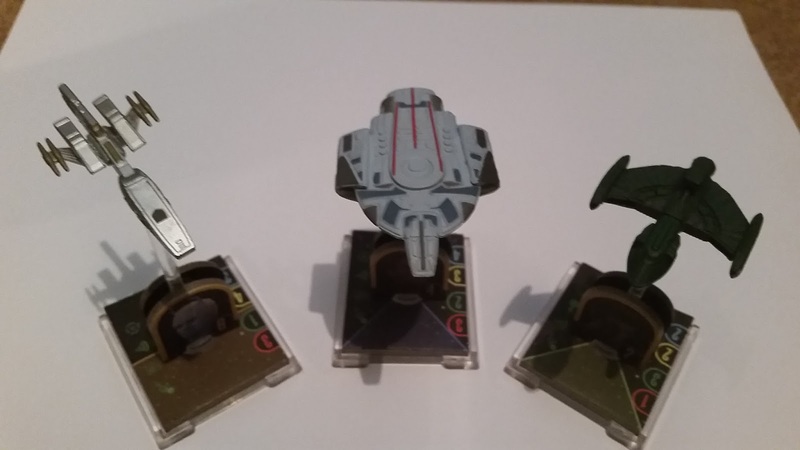 Wave 21 packed some great new surprises and I had to wonder if the following trio of ships could compete. 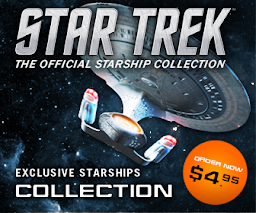 Wave 22 brings the USS Valiant, the Romulan scoutship Pi and the Andorian Kumari cruiser. The Defiant Class Valiant is the third retail version of the ship to be released if you include the Mirror Universe edition and this time there's a significant increase in the accuracy of the model. The engines on the original were horribly blocky and lacking any fore or aft detail but here Wizkids have managed to feed in some detail marking out the bussard collectors (in yellow?) and the warp coils where once was blank plastic. For some reason the addition of this detail must have had an effect on the cost since the Starfleet pennant has disappeared from in front of the sunken bridge. 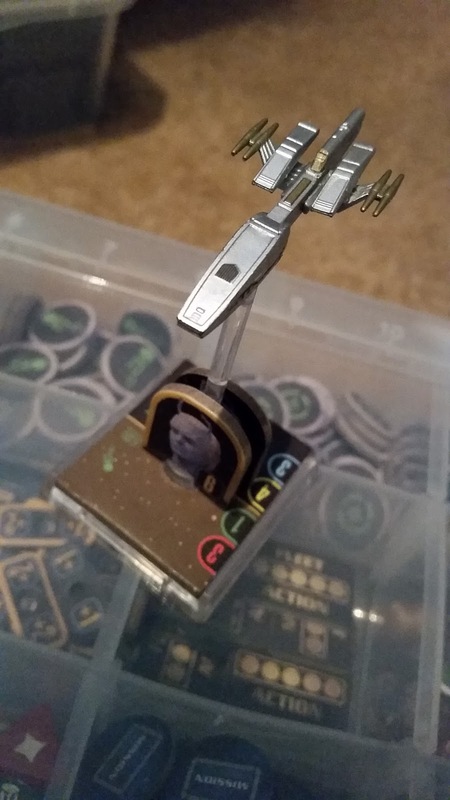 Aside from that omission the increase in engine detail does improve it considerably showing that Wizkids are looking at improving their standards with each new release. I hope this is going to be maintained for Frontiers now due out in May 2016. So to the pack. 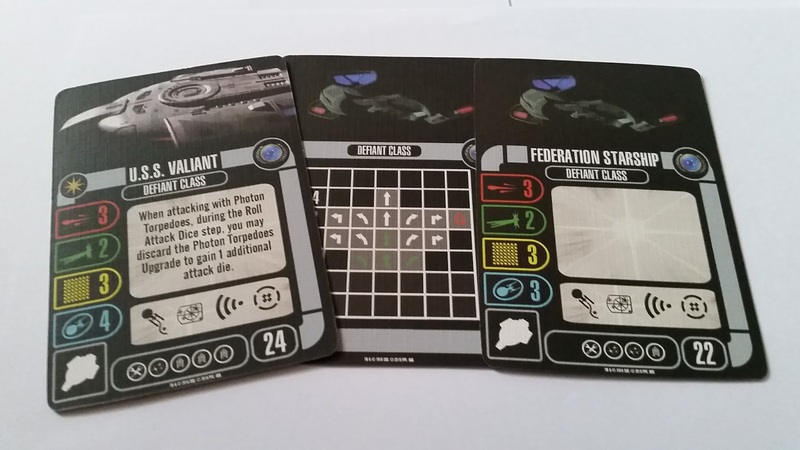 The Valiant runs with identical stats to the USS Defiant at three in attack, two for defence, three hull and four shields along with the options to slot in three Crew, one Weapon and one Tech slot. 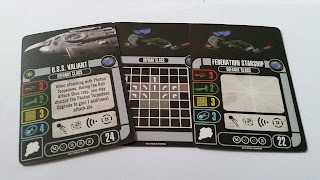 For your initial spend of 24 points you also get the Federation norms of Evade, Target Lock, Scan and Battle Stations. Stepping down to the standard version of the ship you will lose one shield plus your upgrade options will change to one Crew, two Weapon and one Tech. The class still isn't the fastest in the fleet, topping out at four but with full maneuoverability at speed two, the full range of motions at three plus that Come About. Range one offers just the forward and left/right banks. It's another low skilled captain to add to your selection with the cadet-come-commanding officer, Tim Watters. Able to field an Elite Action, Watters also provides an additional crew slot for your ship and can remove all the Disabled Upgrade tokens from your crew cards. Not too bad for just three points cost considering the double benefits. The Elite Action linked with Watters is Red Squad. 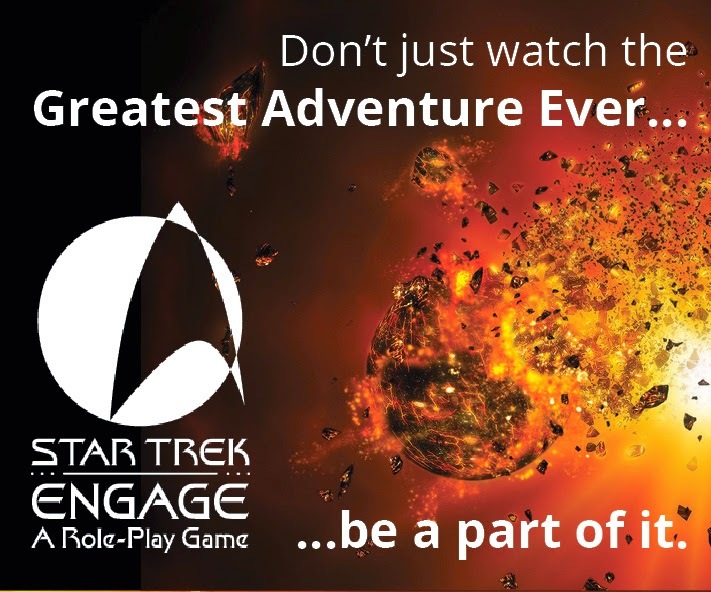 Mentioned and seen in both The Next Generation and Deep Space Nine, the elite cadets here allow you to amass a number of Scan, Evade or Battle Station tokens equal to the number of crew upgrades you are fielding on the vessel (four maximum). Before performing an Action in the Activation Phase you can remove one of those tokens and drop it by your ship, effectively giving you a series of free actions to help anticipate upcoming dangers. Costing five points, I quite like this and once again it's a twist on some of the gameplay basics. It's also something that will upgrade your ship for more than just one round of the game. As the Defiant is the only ship of the class with a cloaking device you won't find one in this pack nor will you find any Tech upgrades which did surprise me a little. 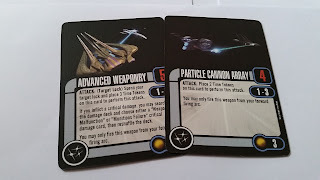 There's also only one Weapon upgrade which is the always included Photon Torpedoes. It is the new standard version utilising the Time Tokens just for reference and is priced at five points. Valiant's crew are the rest of the cards in this pack. Dorian Collins comes in at a very affordable two points offering the chance to immediately repair a shield should you suffer any hull damage. Being a disable on such a feature is unusual as they tend to be discard actions and for the price it's very reasonable to get the chance to restore your ship and fight another day. One point, as I've discovered, can make all the difference. 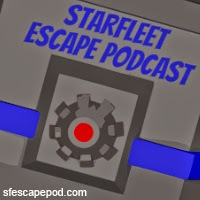 Doubling up in expense takes you to the Valiant's first officer, Cadet Karen Ferris. I think this is a wonderful card to have available. My thoughts with it would be to disable Ferris, roll your torpedoes and then use the Target Lock for a re-roll if required. 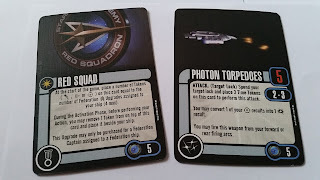 Please let me know if this is against the rules but I don't see that it is and makes those Quantum Torpedoes a much more enticing upgrade to link with this crewmember. The last cadet included in the pack is Riley Aldrin Shepard. Costing five points for a disable is a reasonable price to perform an additional green "one" maneuovre. As a little bonus Shepard will also remove any target locks on your ship and stop it from being locked during the same round. 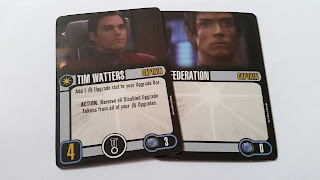 He might be the final cadet option but Wizkids have also popped a new Nog card into this expansion too and he provides the chance for one of two Actions to be completed. Not can be disabled to repair one point to either your shields or hull or he can be disabled when performing a Red Maneouver to remove an Auxiliary Power Token after skipping the Perform Action step of the phase. Nothing new here in the avoidance of power tokens but having another dual purpose card and one very well priced is a good move. The Battle of El-Gatark is the scenario for players this time round and there's a twist with this two player game seeing opponents taking the choice to repair either their engines or their weapons first. This is done through the removal of mission tokens from two piles for each ship determining which feature will come back on line first. Is it more important to get some distance or take out the other player...? 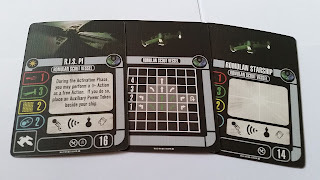 Another month brings another "core" faction ship in the form of the Romulan Imperial Starship Pi. A scout vessel, ths the pack is loosely built around the third season of The Next Generation, namely The Enemy. The Pi will never be a front line choice with a starting points score of 16 and stats of one in attack, three in defence (that will come in useful) , two hull and two shield points. She carries only two upgrade slots for a Tech and a Crew option so you won't be adding torpedoes here any time soon. As well as those two slots the Pi has the standard Romulan actions of Evade, Scan, Cloak and Sensor Echo. The unique action available here lets the scout ship perform a free Scan during the Activation Phase but will incur the usual Auxiliary Power Token penalty. As usual the generic scout ship option loses the unique action plus one shield and the Crew upgrade for 14 points. As for movement, the Pi does benefit from zero red maneouvres and a full range of turns including the 180 come about at speed two. She tops out at four with just the bank turns available at speed three and everything except that 180 spin lined up at speed one. 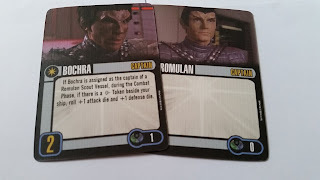 Bochra comes with the expansion as your captain selection but I suspect that you'll already have some stronger command options in your Romulan faction if you're going by captain skill since he pulls in at just two points. Bochra does offer benefit to the scout ship though when linked to the Scan action. He'll let you roll an extra attack and defence die which is pretty good and combines with the Pi's unique action. So to your loyal Romulan Crew upgrades and highest cost goes to Pardek. Eagle-eyed fans will immediately recognise him from Unification so how he fits with this pack is anyone's guess. Could this have not been Command Officer or something? Anyhow, Pardek's action allows you a breather with a ship at range three being stopped from attacking you and vice versa. 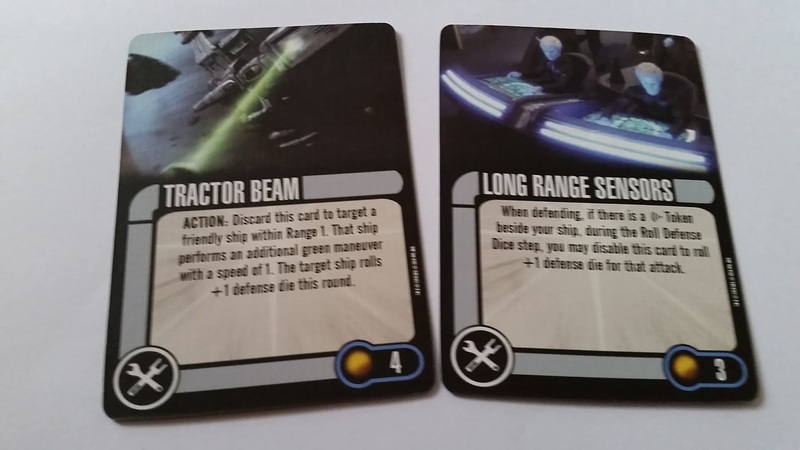 I think in regards to cards like this it would be beneficial in some instances to just have the opponent blocked from attacking and perhaps your ship being able to attack at a reduced number of dice. For a discard it's a costly five points given it probably won't assist you that much. Now whoever created this pack isn't aware of the Klingon language it seems since "Patahk" is a Klingon insult but here gets used as the name for a Romulan crewmember. Whoops. At least he only costs one point to equip and offers the chance of an extra die on attack. Patahk is a discard but with the low cost it's not a bad option perhaps on a larger craft. The Tech upgrades are a little more exciting to discuss with Gravition Field Generator letting you rebuild a shield during the Deal Damage stage as long as you're not cloaked. Very useful especially for a small ship such as the Pi which is likely to be an easy target early on in the game. Two points and a discard is well worth the investment but having only one Tech slot available does mean you'll be carefully weighing up the options. Also a two point discard is Distress Signal. 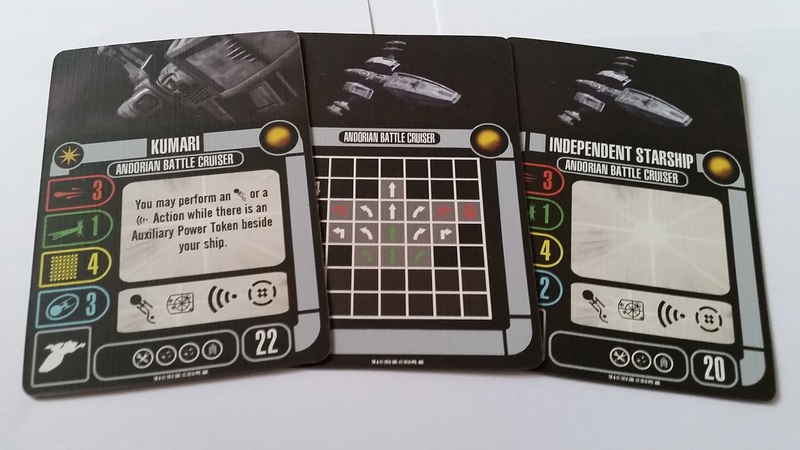 A little bit more complex to get your head round, it allows you to roll two extra defence dice but only if there is a ship within a maximum of range two with a hull value higher than your own. One of those situational cards but it would, in the case of the Pi, increase your defence for one round up to five. That's an impressive strategy given the nature of the craft looking at its basic stats. The final Tech upgrade is your last stand - Self Destruct Sequence. A certain last gasp Action it allows you to destroy your own ship and deal one damage point to every ship within range one. I am still very undecided whether these are a good option to equip given their finality but I guess it could make all the difference if you know that your ship won't be surviving into the next round. Best ensure you're well positioned for full effect. It goes without saying that you can only equip one of these per ship. Although Bochra can't technically field an Elite Action, the RIS Pi does contain one in the form of Covert Mission. Why? Because even if your captain doesn't have the emblem on his card this ability can still be provisioned but will cost six instead of five points. 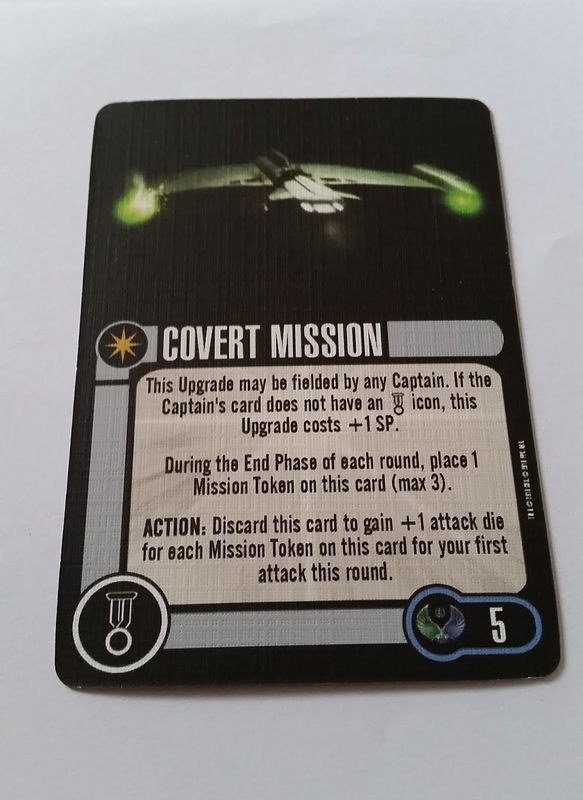 To use the ability, the player places a mission token onto the card at the End Phase up to a maximum of three. You can then discard the card to gain an extra attack die for each mission token you have amassed. That would, at best, increase your firepower on the Pi to four which is comparable to something like the Defiant. 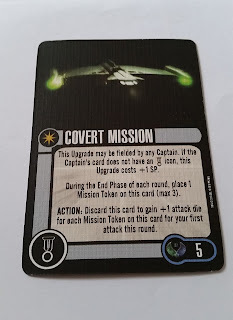 The enclosed two player scenario is also entitled Covert Mission and sees the Romulans encountering a Federation starship close to Galorndon Core. 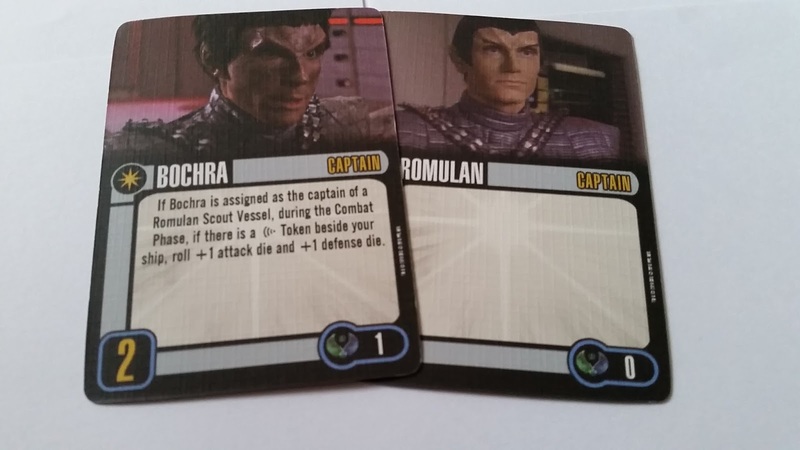 Two Romulan ships take on a single Federation craft here with the objective to collect data (mission tokens) from the planet and escape. 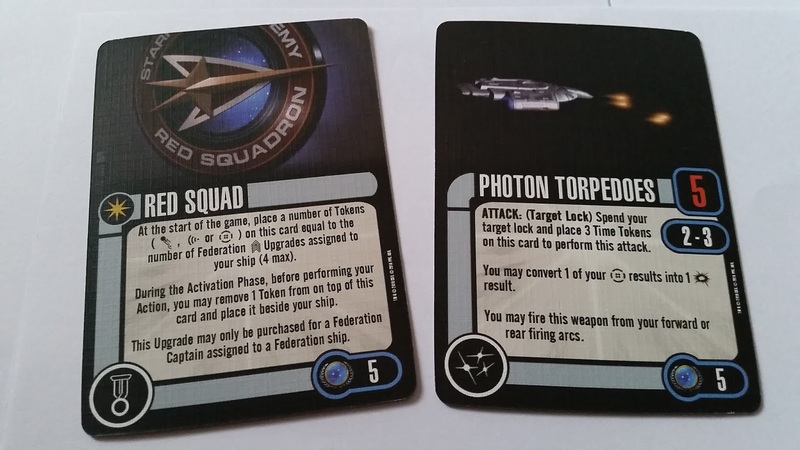 The Federation ship can only attack once a token has been picked up and is tasked with destroying the scout ship before it can escape. 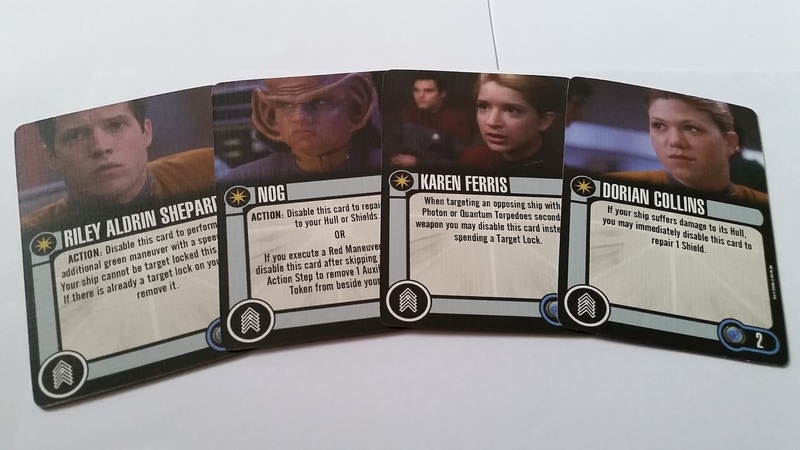 The card does indicate a Galaxy Class starship for the scenario which keeps it linked back to the third season of The Next Generation. For Enterprise fans Wave 22 is completed by the introduction of the Andorian Kumari battle cruiser. Classed as an independent craft its stats are much better than I expected since those ships from the prequel era tend to have lower figures. Rolling in with a respectable 22 points, the Kumari offers three in attack, two in defence, four hull points and three shield points. 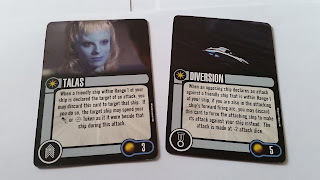 The Andorian ship enters the fray with slots for two Weapons, one Tech and one Crew upgrade plus the usual Evade, Scan, Target Lock and Battle Stations actions. As for the Kumari's unique ability she can still perform an Evade or Scan even with an Auxiliary Power Token applied. That really is flipping useful and means you're not hand-tied during the action stage. Brilliant option and very, very different. 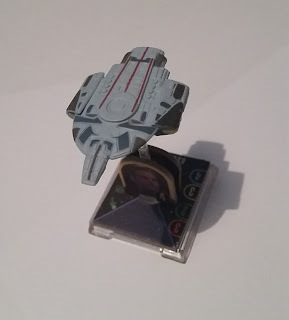 If you choose the generic cruiser, you lose the customary shield point, the unique action and one of the Weapon slots for 20 points. As for speed, again as with the Valiant and the Pi she tops out at four but does incur the Auxiliary Power Token penalty for 90 degree left and right plus the Come About at speed three. Speed two offers a full range while one offers just forward and the left/right banks in green. In conclusion, pretty maneouverable but just not super quick. 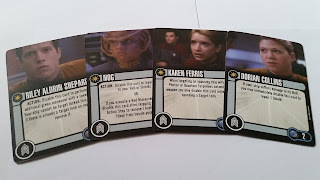 So to captains and as with the previous two packs we only have the one "decent" choice plus the zero pointer. 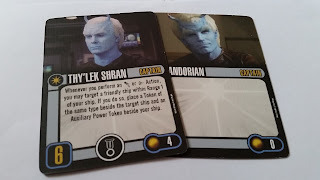 This time it's Thy'lek Shran as it could only be. An average skill of six with a cost of four is middle of the road plus he can field an Elite Action. 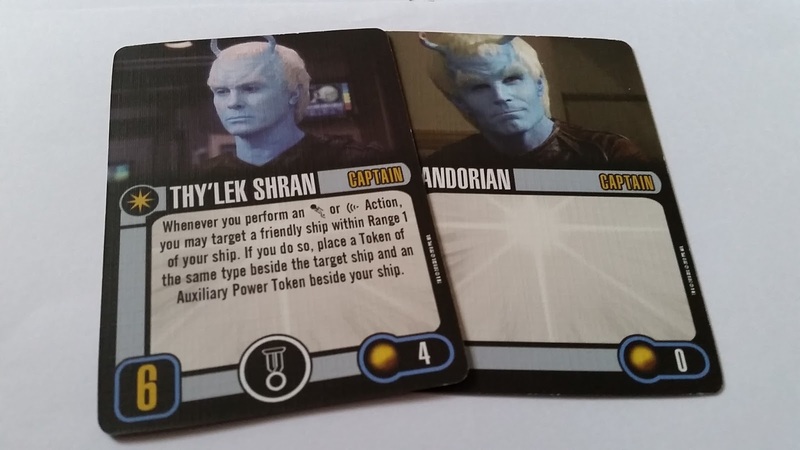 Playing on the Scan and Evade action of the Kumari, Shran then allows you to target a friendly ship at range one and pop either one of those tokens (Evade or Scan) next to that ship while you take on an Auxiliary Power Token. It seems even here that this pack has been tightly planned with the cards playing well against each other for maximum combos. 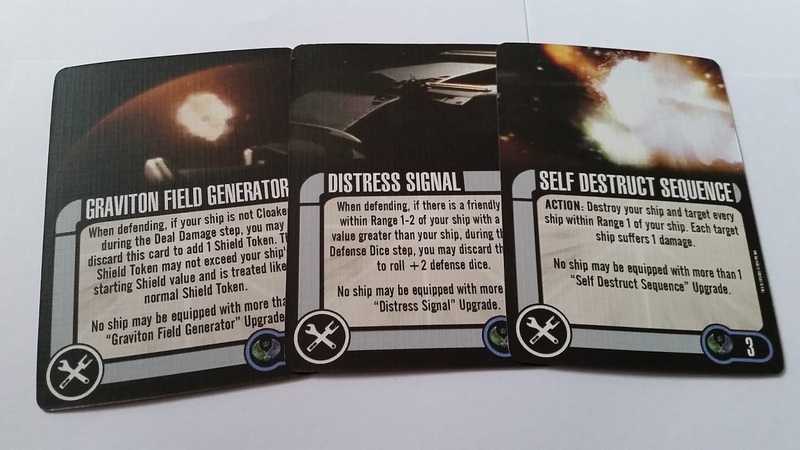 Shran's option of Elite Action with the ship is Diversion which will redirect an attack on a friendly ship onto the ship fielding this card. That attacking ship must be in range one and you must also be within its forward firing arc. That's once again relying on a lot of things to fall precisely into place for a one-shot discard at five points. Bonus enticement though is that this card also forces that attack to be played with two less attack dice. Might come in useful against the Scimitar's Thaelaron Weapon for example. The Kumari has one Crew upgrade available with Talas for three points. 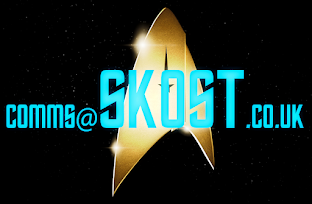 The Andorian officer offers support to another ship in your fleet should it be targetted for attack. 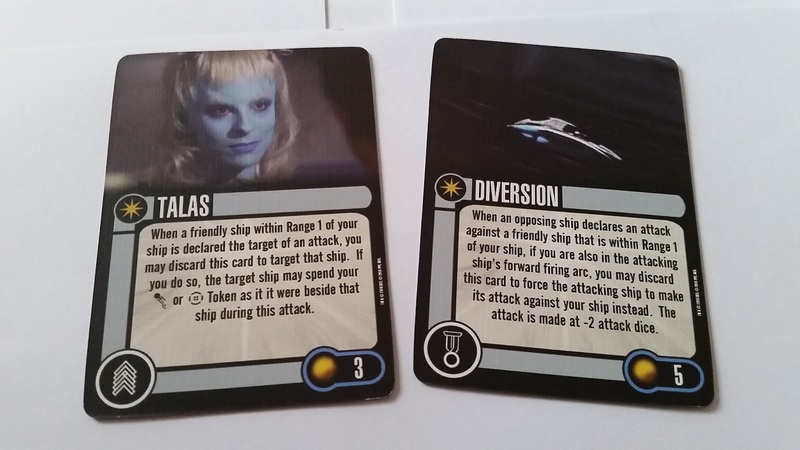 If Talas' ship has a Scan or Evade token that can be transferred and used on the ship under attack. Note again that use of two core actions as part of the pack - very specific and you'd be almost tempted to run this ship as the pure expansion just to reap the benefits. Two Weapon upgrades offer a little more than just torpedoes this time. 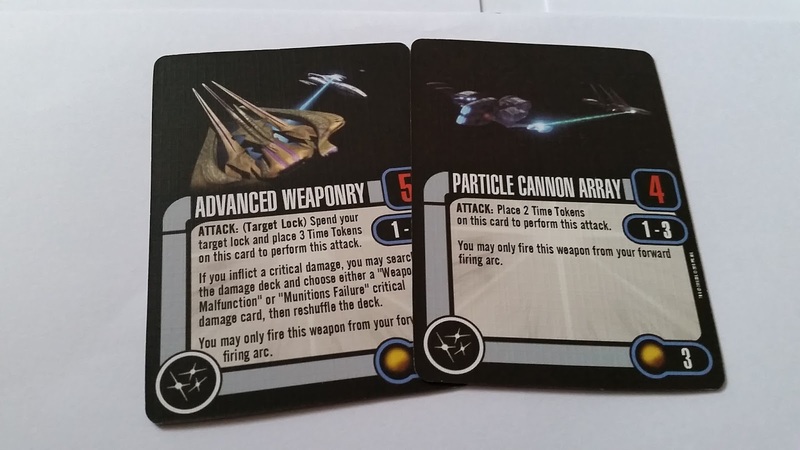 Particle Cannon Array will boost your attack by one die to four if deployed on the Kumari and is available between ranges one and three. It is only forward firing and will incur two Time Tokens to be re-enabled. For three points though it's a good reusable option to increase your offensive capabilities. The more powerful Advanced Weaponry is also only a forward firing option and incurs three Time Tokens when used. Using five attack dice and again available across all ranges from one to three it has one big draw. If you inflict Critical Damage then you can select Weapons Malfunction or Munitions Failure from the damage deck and cause a few serious headaches for your opponents. This has to be an essential card to use if you're a lover of the Independent faction and for five points it's one I would immediately pick just because of the devastation it can inflict. 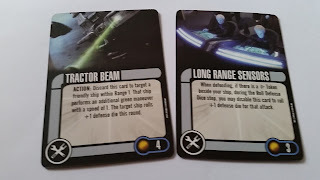 Tractor Beam is one we don't see too often but here there's another twist to the pack with this action allowing you to discard the card (four point cost) to target a friendly ship at range one and let it perform an extra green maneouvre at speed one plus gain a defence die for the round. Double bonus and does hint that the Kumari is a superb option to have as a backup vessel working to support larger front line craft. Long Range Sensors for three points is the last of the upgrades here and lets you take one final advantage of Scan by disabling the card and rolling an extra defence die for a single attack. The Battle of Andoria completes the set and can be played at varing levels of difficulty depending on your abilities with Attack Wing. A solid two player scenario you have to defend Andoria until reinforcements arrive indicated by the increasing number of misson tokens per round. I tend to enjoy the time limited scenarios more purely because you have to think about the game a lot more and be a heck of a lot more perceptive in your moves so as not to waste any time. OK, so Wave 22 is a lot more solid that 21 and I really can't complain that much. 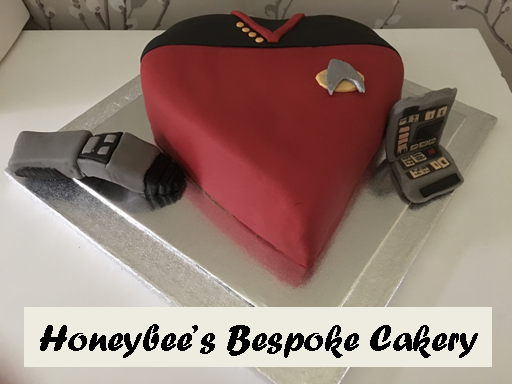 There's something for everyone here - a Federation addition (and not a bad one either) and two good support options with the Pi and the Kumari. If you were mixing and matching this could be a decent little starter fleet with each ship offering some real varied options and styles of play. I know that all three will definitely see some action given their features and I would recommend these to a lot of players. At first I would have said the Valiant is the real star of the trio but after a good read through the Kumari nails it on the way the pack has been constructed around two basic features. 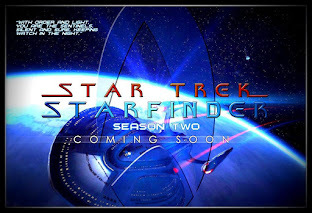 Looking forward we have Wave 23 focusing on the "core" Federation (Saber Class), Klingon (K't'inga Class) and Romulan (22nd Century Bird-of-Prey) factions followed by 24 which will see the SS Raven, a Klingon D-7 cruiser and a D'deridex Class Warbird for the Romulans. Highlights there? The Raven, Sabre Class and potentially the Enterprise era Bird-of-Prey - but I have been wrong before! How did you find Wave 22? Any stand out features you need to use?